It’s been a long time coming that I actually use the meat of a burger as buns – but that time has finally come! 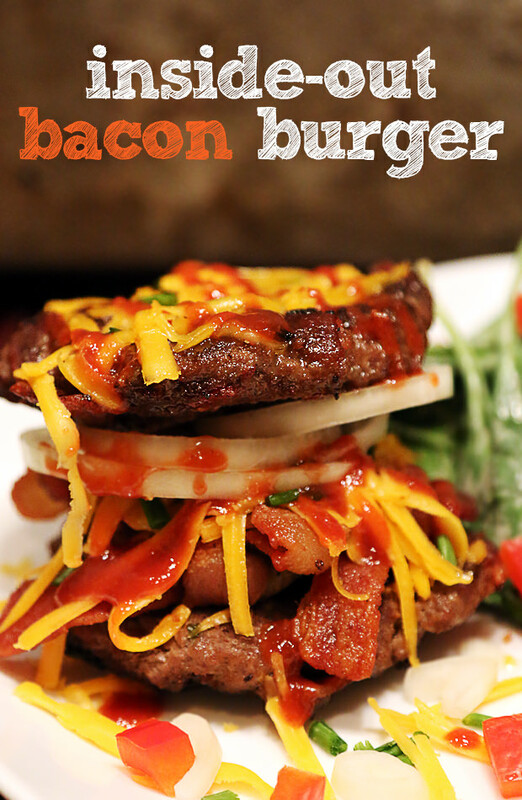 Bacon, cheese, and some crispy raw onion between 2 patties of…more bacon and ground beef? Count me in! If you’re feeling extra frisky (and have the calories to fit it in), I HIGHLY suggest throwing some Bacon Jam in the middle of this sucker. Not only will it bring an awesome contrast in the flavors with the vinegar of the jam, but it adds more bacon! Okay, since switching to a ketogenic diet, I might have gotten obsessed with bacon – but I’m sure I’m not the only one. If you like bacon (and who doesn’t!? ), you’ll love this one! Now, I know when you cook your bacon and have it all crisped up, you will want to snack. Just don’t do it! If you must, cook extra bacon to snack on. The 8 slices is needed to pack between your burgers once you’re done cooking them up. It gives an awesome crunch as you chomp into those 2 patties. It’s important to keep your eye on the burger while it’s cooking. You want quite a hot pan when you put the burgers in there – I aim for a nice deep sear on the outside with a nice pink inside. That’s me though – normally 3-5 minutes on each side depending on done-ness you want will suffice (I normally aim for 3 and a half minutes on each side for rare to medium rare). 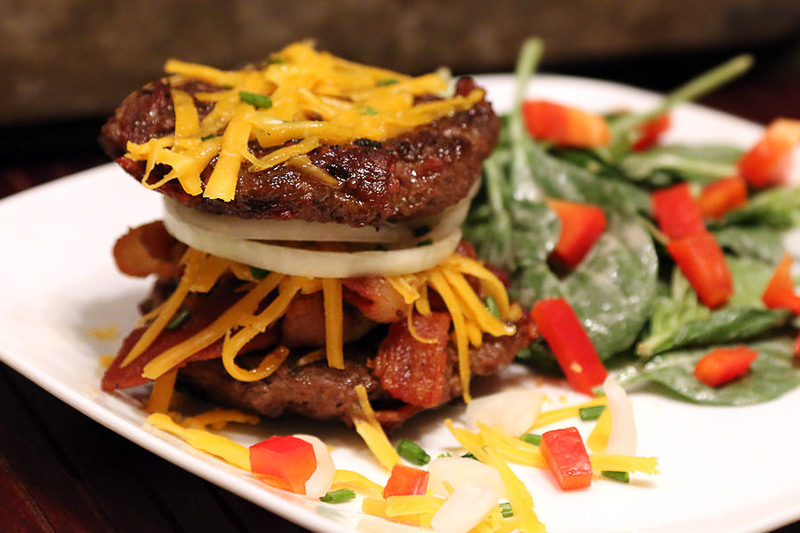 Obviously, the longer you cook your bacon burger, the more well done it will get! I served this with a side of spinach salad, heavy handed with Caesar dressing, and some diced red bell peppers – great crunch to add as a side! 1. 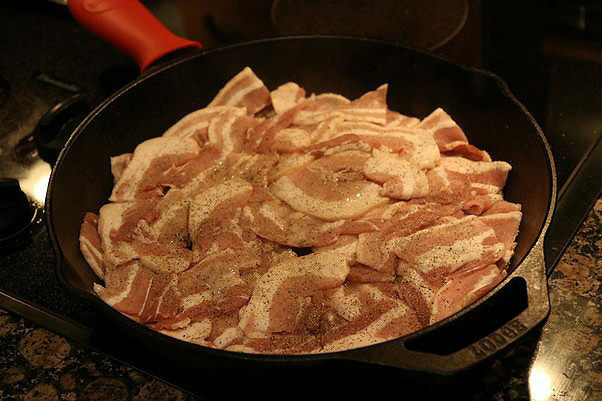 In a cast iron skillet, start cooking 8 Slices of chopped bacon. You can season with spices if you’d like. 2. 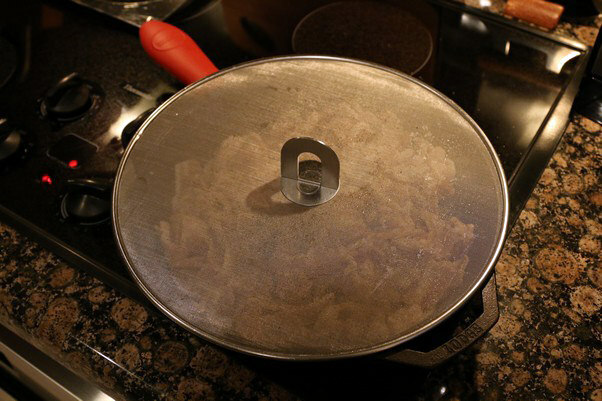 Continue cooking it, covering the pan with a grease catcher – this stuff will get seriously messy without one! 3. 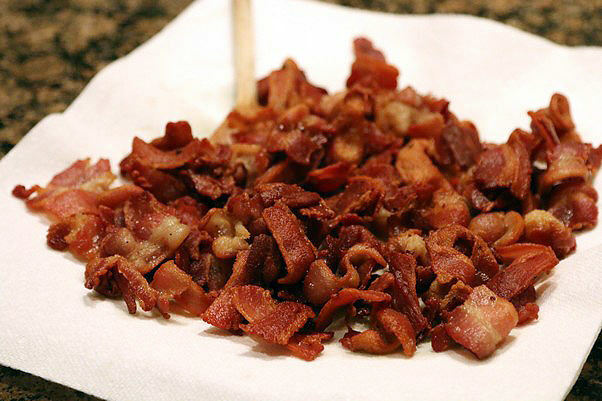 Once the bacon is cooked, remove it from the pan and set aside on some paper towels to crisp up. 4. 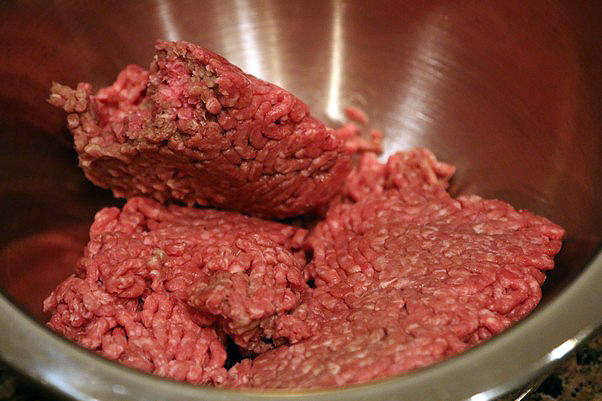 In a large mixing bowl, add 800g (28Oz) ground beef. 5. Add 2/3 of your bacon, 2 Tbsp. Chopped Chives, 2 tsp. Minced Garlic, 2 tsp. Black Pepper, 1 Tbsp. Soy Sauce, 1 1/4 tsp. Salt, 1 tsp. Onion Powder, and 1 tsp. Worcestershire Sauce. 6. 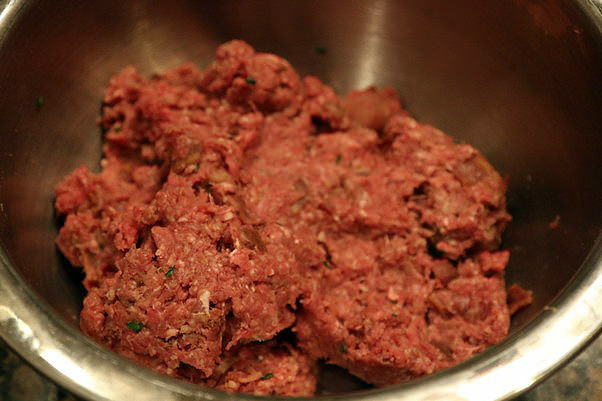 Mix the meat and spice mixture together well; make sure that all of the spices are evenly distributed in the meat. 7. Form patties with your hands. You should be able to get 9 relatively large patties from this. 8. In a cast iron skillet, add 2 Tbsp. of the previously saved bacon fat. Wait until it gets got and then add your burger patties. You can add 3-4 at a time. 9. Flip the burger patties after 3-5 minutes (depending on the done-ness you want), and continue to cook on the other side. 10. Serve with cheese, extra bacon, and onion if you’d like. Also, feel free to add a dash of sriracha over the top! Makes 6 total servings. 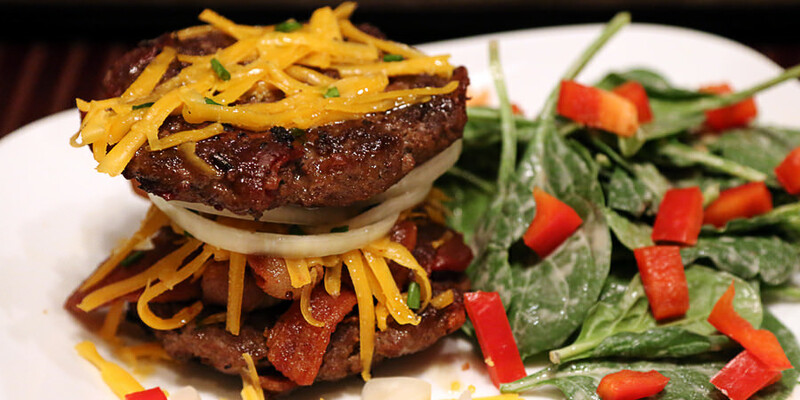 Each serving is 1 1/2 Bacon Burger Patties, coming out to 433 Calories, 34.5 Fats, 1.2g Net Carbs, and 29g Protein. In a cast iron skillet, cook all your chopped bacon until crisp. Once cooked, remove and place on paper towel. Drain grease separately and save. 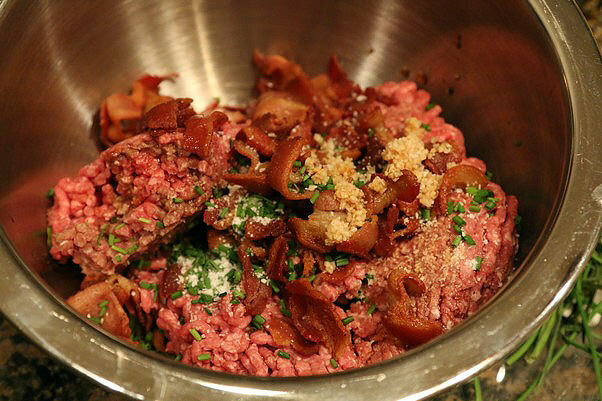 In a large mixing bowl, combine ground beef, 2/3 chopped bacon, and the rest of the spices. 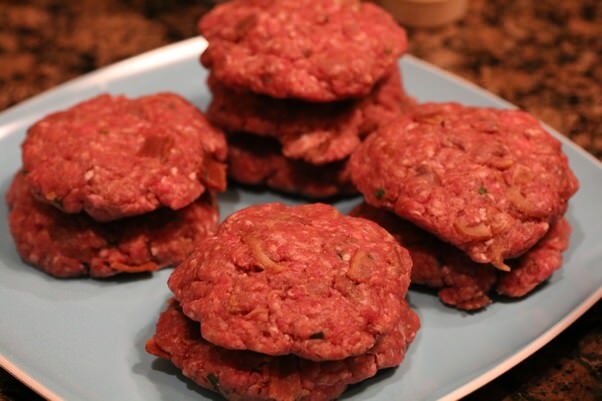 Mix meat and spices together well, then form into 9 patties. Put 2 Tbsp. 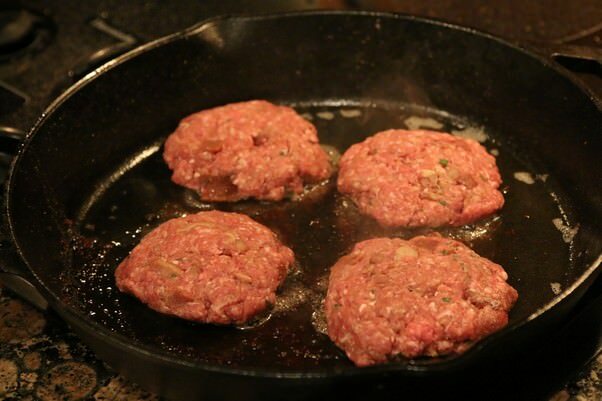 Bacon Fat into cast iron and place patties inside once fat is hot. 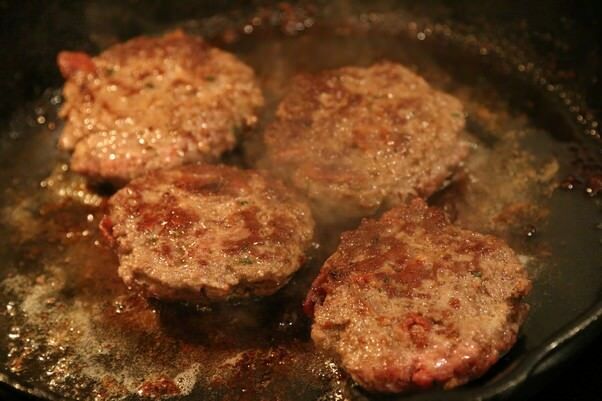 Cook about 4-5 minutes on each side (3-4 patties at a time), depending on the doneness you want. Remove from pan, let rest for 3-5 minutes, and serve with cheese, extra bacon, and onion if you'd like.